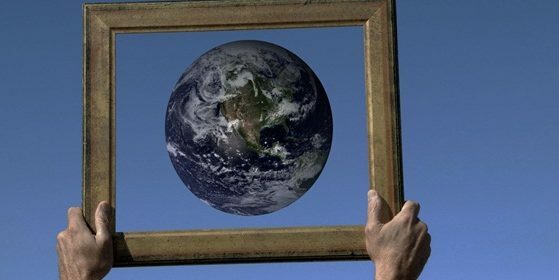 The way we see ourselves, the world, and other beings is part of the root causal problem. This has been briefly introduced with the concept of axioms that shape our way of living. Our perceptions are being manipulated to construct an unrealistic illusory way of living that is not in harmony with Natural Law. Worldview shapes the way we manifest consciousness in our lives. What we spend time on and what we pay attention to is what we think about and that affects the way we feel and act. How and what we think affects our perception of ourselves and the external reality. This understanding does not mean to only look at the positive while ignoring the negative in the world or ourselves. Our minds and hearts have fallen into darkness to produce the conditions we see manifested by our collective behavior. The negative effects, symptoms and problems that we are collectively co-creating need to be recognized. Understanding the root causal factors of how and why our current condition is happening puts us in a position to act in a way that is different, to produce a different result, because we know and truly understand how not to produce the same result. Solutions to a problem require an accurate honest assessment to determine the actual nature of the problem by facing the truth, both positive and negative, even if it makes us uncomfortable. Why are we experiencing this current condition? How are we being deceived and manipulated? How important is truth? What are the motivational factors that drive certain behavior? Making decisions based on lack of knowledge and understanding is rooted in a state of internal confusion whereby we do not understand foundational principle root causal factors, so we continue to perpetuate more of the same because we do not recognize that our actions are based on a lack of understanding. If proper, accurate, correct understanding is reached then our decisions will not create more of the same. Our choices will not be based on confusion from lack of information, lack of knowledge, lack of understanding, but will be based on truth of the reality and these foundational root causal factors that will allow us to see things clearly and not make decisions that lead to the same results. To think that we can fix things by becoming part of an institution of control such as government, police, military, banking, religion, etc., is action based in confusion. A person can have good intentions in following one of the preselected paths that are part of the problem, yet think it will create solutions. Doing the same things again and expecting different results is not productive. As the saying goes “The road to hell is paved with good intentions.” Basing decisions on lack of critical knowledge and understanding is ignorance of the root causal factors and acting in confusion to try to manifest what we want or wish to have. Supporting controlling institutions to control others is not the solution. Education out of darkness by bringing clarity of understanding is part of a solution. People often want to be a part of something greater than themselves, it gives one a greater sense of purpose. Our beliefs and faith in something can be misplaced by the definitions and meanings we have associated, related and identified with our so-called higher purpose. We will be very content with continuing to believe in such a construct. This is how most institutions work: military, police, religion, government, etc. People give of themselves to be a part of a greater higher purpose, or so they believe it to be. Many people can’t discern what truth from fiction is and end up giving of themselves to false institutions believing that they are a part of a greater higher good. There are always aspects of truth mixed into the control structure to make you believe it is for good. These are illusions and attachment to them. People will be in denial, not wanting to admit they were deceived, manipulated, fooled, tricked, duped, conned, scammed, screwed, bamboozled, hoodwinked, lied to, that they made a mistake, that they were unaware, uninformed and most of all wrong. So instead of course correction, they continue down the path to self-created suffering and keep everyone down by their ignorance and denial. People want to do good, they truly do, but they lack the ability to discern what is good, they don’t trust themselves enough or don’t want to take the time it takes to discover, and so they get led down a false paths. Only by addressing the root of the problem and correcting the source cause that is responsible for creating the condition we experience will we be able to effectively change things for the good. We are required to let go of attachments to false beliefs in illusions that lead us on erroneous paths. This graph is originally made by Mark Passio and I have remade it with some additions. 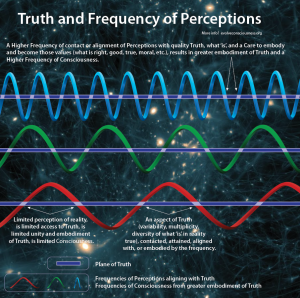 Our perceptions can be in low frequencies due to limited alignment with the truth. 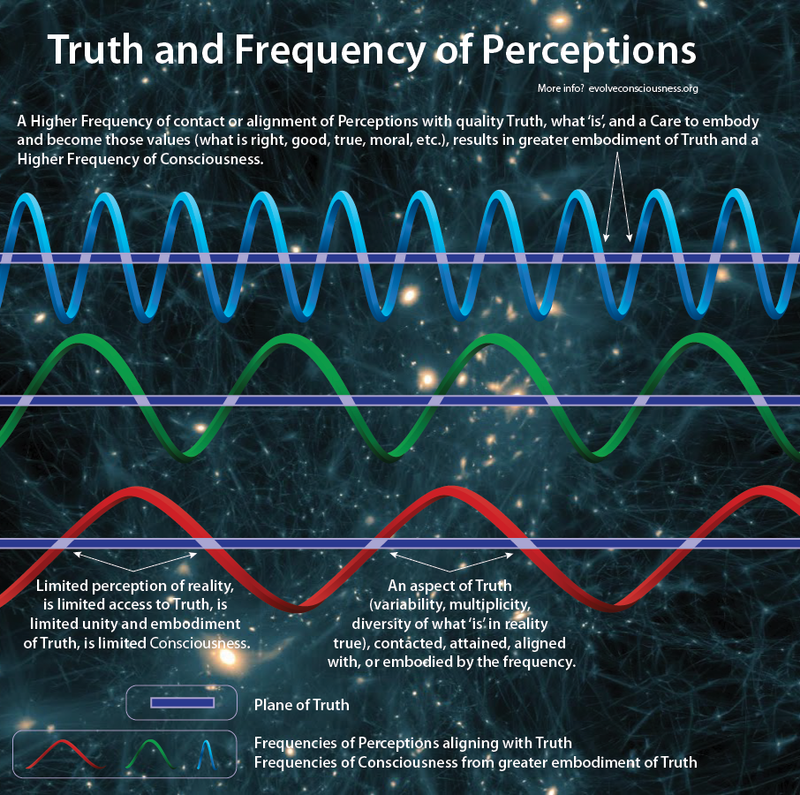 Our perceptions do not intersect with the truth frequently enough, so we have a low frequency of perception. 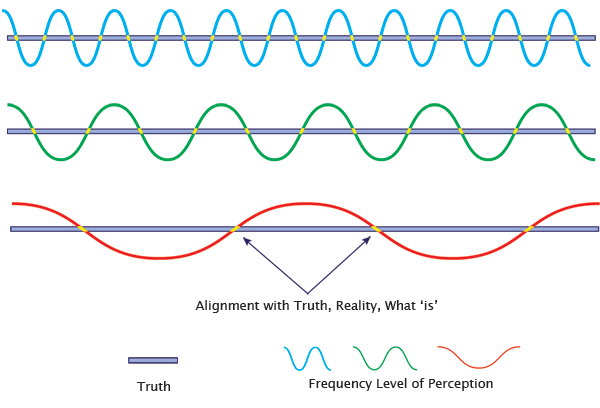 The truth and understanding of reality we gain by aligning our perceptions with and seeing reality as it is, increases the frequency of interaction with the truth in our lives, but also increases the frequency of our being. The more our perceptions align with the truth, the higher our frequency of functionality with universe/reality will be. The more our frequency of perception and being attunes to the basis of truth in reality, the higher our frequency of being becomes, expanding our consciousness which is the true force of love. At first we may not have an accurate perception and understanding of reality. Our conscious awareness is low, and therefore our level of consciousness is low. As we align our perceptions with reality, truth, what ‘is’, we increase our conscious awareness of reality, and we expand our consciousness, which is the force of Love. Increasing consciousness and Love is done by less wavering from the truth and instead more resonance and alignment with it. 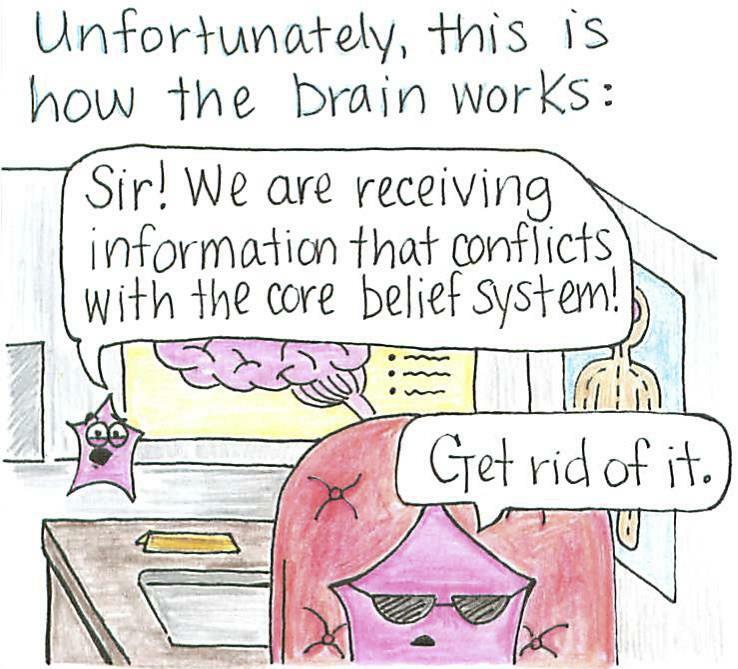 Dysfunctional beliefs and cognitive distortions are possible because we choose to accept falsities, deceptions and illusions that sound good as an explanation or allow us to feel-good about ourselves or our current way of living. Our perceptions, beliefs and worldview should align, harmonize, unite, etc. with the truth of what ‘is’ occurring, both around and within us so that we have the ability to respond from a place of understanding what is happening. The nature of the problem lies at the level of belief. Belief is the foremost causal factor underlying what we experience. We believe in falsehoods and reject Truth. If our view of ourselves is based in indoctrination, tacitly assumed to be valid, or influenced by dysfunctional interconnected beliefs, we are not following our true desires of what we want to live by and uphold in our own lives. If we claim to be for non-violence and not doing harm, yet we have been conditioned into engaging in such behavior without recognizing it for what it ‘is’, without truly being consciously aware of what we do, then these conditioned beliefs are preventing us from actualizing the core desires we want to live by. We are failing to live up to how we want to live our lives because we are not aware or unwilling to face the reality of our condition we find ourselves in. Conscious awareness of ourselves and reality can be increased so that we become more aware of what we think, feel and do. The biggest reason for not changing is the “feel-good” about ourselves comfort of thinking the way we are and what we do is great, perfect, good and doesn’t need to change. We like to believe what we do is good, and that we don’t do wrong, so there is no need to change anything since we are not doing any wrong. The realization of the truth about ourselves and how we behave is the first step of becoming uncomfortable about what we actually do and our current state/condition, and then progressing towards self-improvement and change. We like to think we uphold what is true, what is right and good, and by extension that makes us true, right and good. When we are faced with the conflict of how we perceive ourselves to be in alignment with the beliefs we want to live by, and the actual actions, behaviors and habits we engage in, it creates cognitive dissonance where two conflicting beliefs cannot be mutually held in harmony, in unison, in integrity, in coherence. These two conflicting beliefs create internal conflict, internal opposition, and we often rely on denial (avoidance coping) to excuse, justify and reason our current way of living as true, valid, correct, accurate, right and good, because we like to see ourselves that way, and don’t like to admit to ourselves that we aren’t 100% perfect and will never be. It is much easier to stay living a certain way that we already are doing, and not admitting to being wrong, unaware, uninformed, manipulated, etc. which would present us with opportunity for change, betterment, improvement and personal evolution. The security of believing the current conditioning and way we are living is far too comforting and provides the mindset to feel-good about our current lives. In avoiding the true source of the reason we do things, it allows us to attempt to protect ourselves from psychological damage, i.e. cognitive dissonance kicks in. People believe in things that are not there, illusions. Our society is founded on sleight-of-hand magical trickery. Passing a law is sorcery. Something is wished into existence like a magician who pulls a rabbit out of a hat. If we want to believe that is what happened then we believe it. If we know there is another explanation we can sense something is not right even though it appears to have happened. Illusions of sorcery appear to be real until we know how they work. Being tricked and fooled by sorcery modifies our behavior in alignment with the belief we now accept. This is the spell that is cast upon us. Belief constructs are manifested into existence at the whim of a pen or spoken word. We then accept them and conform to them as we live our lives in these illusory constructs. Truth unites. Lies divide. Love embraces truth. Fear rejects truth. There is an effort to promote spiritual unity by respecting everyone’s beliefs. This has not achieved unity but has created separate fantasies for everyone to remain attached to as part of their identity. To be unified requires being on the same page of understanding basic truths, not beliefs that make us comfortable and feel good in contradiction to what ‘is’. Common ground is what unites. Believing in fantasy illusions and deceptions is not the basis for unity. Consider if you would want to be friends with a psychopath, or a serial killer. Would you trust your child with them? That was an extreme example, but it illustrates that the more of a divergence in our values and ways of living, the less common ground there is to develop strong bonds in a relationship. There are extreme worldview illusions that create a divergence in ways of living and understanding truths. A false dilemma or dichotomy is black and white thinking that creates false limitations in choice when there are indeed other options available. This is not to say there are no situations where there are indeed limited choices. The false dichotomy setup can be done with two or more options that try to limit possibilities of other choices or actions taking place. This can be expressed by people who may not be aware of what they are doing. Having someone accept a false dichotomy and forcing them to choose between limited possibilities that you control at the outset is employed in many ways. In the film The Last Boy Scout, the main character asks people “head or gut?” because they are either getting punched in the head or in the gut. You can ask someone do you want to get slapped with the right-hand or left-hand. It doesn’t matter what they choose, they are getting slapped either way. You can ask a child if they want to eat carrots or peas for supper, either way they are going to eat the vegetables that they don’t want to eat. Presenting a choice, no matter how false or illusory it is, is much more appealing than being forced in a direction that is already predetermined. When someone believes they have the power to make a choice in their lives, they think they are free and this makes them happy to have some form of control over what goes on in their lives. This can lead people to believe there are only certain choices one can make in life. Other ways of living, deciding and behaving are ruled out of our imagination that would allow us to conceive of another way that might be better in which to live. A false dichotomy presents an illusion of choice between limited possibilities in order to constrict a person’s consciousness and imagination from envisioning and choosing other possibilities. One of the most effective false dichotomy deceptions employed consistently across the planet is that of voting. Politics is based in deception on many levels and voting is the biggest trick to get people to think they have control and power over what goes on in their lives. People like to believe that voting makes them responsible and good citizens. Voting is an abdication of personal responsibility in which you allow someone to re-present you instead of you presenting yourself as a self-governed, self-ruled, self-realized, sovereign being. People hop around or stay dogmatically allied to one particular party or another and round and round it goes in a circle because we believe it works and we are helping to create change and betterment. When in actuality, the change is that more of our freedoms are eroded and more control is implemented. People don’t want the responsibility of true freedom, they want to give away their responsibility to others and think they will be free. Animals can be trained in a similar way such as with positive or negative reinforcement behavioral conditioning. Specific events are repeated eliciting certain choices and patterns of behavior that become conditioned. We believe doing certain things is good for us because it will get us the result we wish and want. This has been conditioned into us. Understanding how this operates and being able to implement false dichotomies places a manipulator in an advantageous position to carryout mind control. Imagine what is possible with our true potential in freeing ourselves from the various forms of mind control that keep our minds and hearts limited and disunited. Life and the way of living of everyone on the planet can be different but we are holding ourselves back by buying into a fear-based consciousness of thinking the answer is with external control. Society promotes the current control structure through the news, television series, movies, education, literature, newspapers, etc. The dark occultists and controllers are speaking their version of reality into existence for others to believe in, which we accept, and we live within the parameters set forth by those who dictate the illusory reality. Randomness and determinism are both based in the illusory polarity of fear. Randomness is the left-brain imbalance that holds mostly left-brain based ways of being with barely any use of right-brain modalities of thought. Intellect can be strong in left-brain imbalance such as with some scientists, doctors, lawyers, mathematicians, etc. Over use of the left-brain modalities dampens the use of the right-brain modalities which suffer from lack of usage. Living and being driven purely by the physical five-sense-only worldview is a left-brain imbalance. Most of society is geared toward left-brain development with right-brain modalities suffering. The universe is an accident arising from an infinitesimal singularity for no reason. There is no underlying intelligence in nature but random principles coming together. Existence is purposeless, other than to continue existence: survival. This type of thinking is the basis for atheism and scientism, worshiping at the altar of science as the be-all end-all of the explanation to all things, and also the basis for solipsism where nothing can be known. Scientism is a limiting worldview based on the five sense perceptions and the technological instruments we use to extend our ability to perceive the physical reality. Everything is a dead machine of parts with a little bit of life on earth. Viewing the universe and our bodies in a mechanical way is a limiting worldview from outdated Newtonian science. Scientism is believing everything can be explained through the five sense perceptions, while solipsism is believing only one’s perceptions are reality. Both are ideologies where man determines truth and this leads to moral relativism. Believing there is no objective truth, that there is no this or that, is what leads to moral relativism of no right or wrong. This belief justifies having total freedom to do whatever we want based on our perceptions, comfort level and way of seeing the world. There is no acceptance of objective moral principles. What feels-good to our five-sense-illusion is “good” regardless if another being is harmed. This leads to playing “God” with the lives of others, as masters and controllers. God controls every event in creation. Change is impossible and action is meaningless. “God” is viewed as involved and in control of everything, responsible for making the universe continually function like clockwork. Free will does not exist as decisions are determined by the will of “God”. Instead of the randomness of no overriding Natural Law in our lives, determinism negates free will to uphold a conception of Natural Law where change is impossible; it is all preordained by “God”. It tends to lead to accepting the will of authority. Extreme determinism from chronic right brain worldview and modalities of thinking can manifest in lack of a measure of emotional control. Many people who think in such ways are found within religious extremism. All events happen whether we want them to or not. We can’t take the reins of reality and change direction. We are puppets without free will. Accepting any of the characteristics of either of these worldviews does not help us to reach the potential for our evolution in our journey to increase, expand and evolve consciousness. They are not based in the expansive force of Love. They do not lead to freedom, peace, harmony, or anything uplifting and good. Those who base their way of living by accepting such ways of viewing reality will not produce the experience and results that are based in the force of Love. These are belief systems and are not based in Natural Law principles of Truth. Balancing the left and right modalities of consciousness in the way we live, think, feel and behave prevents us from living in the extremities of randomness and determinism. Randomness does not understand the underlying principles in the universe that will allow us to achieve what we work towards if our thoughts, emotions and actions are in unison and harmony with Truth. Determinism establishes everything as predetermined and controlled where we are supplicant to a higher authority that we should fear; we don’t have free will to create what we experience. Reality exists as a synthesis of the two principles each ideology rejects: the random component of free will and the deterministic component of Natural Law. Our choices and decisions based in the force of love or fear determines the quality of our experience. We can align with truth and Natural Law to create freedom and peace or we can choose not to align with these foundational principles and experience more enslavement and suffering. Free will and Natural Law can be understood by recognizing it in operation throughout history, the present and what will be. We are all bound by our free will decisions and those of others. If our goal is to align free will with Natural Law foundational principles that are in operation for our own benefit, betterment and edification, then we will create freedom, harmony, peace, and order. We will continue to co-create self-inflicted suffering as long as we don’t learn the lesson.